Are We Happy Yet? 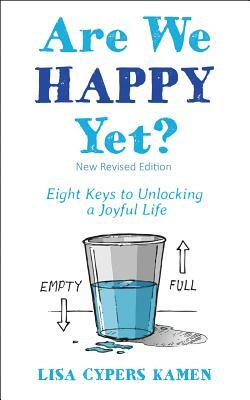 Eight Keys to Unlocking a Joyful Life is an exciting fusion of science and heart, filled with successful tools and techniques for creating your personal "happiness revolution." Lisa Cypers Kamen, an internationally recognized applied positive psychology coach and expert in life-crisis recovery, reveals her breakthrough system for cultivating sustainable happiness and well-being--regardless of life's drama, trauma, or challenges. Her inspiring and practical tips, keys, and exercises will boost your "Happiness-Factor" to new levels and show you how to tap into the joy and peace you deserve. You'll learn how to: -Accept the past for what it is--a reference point, not a destination -Embrace the truth that while life is tough, you can be happy -Transform your relationship with yourself from enemy to ally -Appreciate why less is often more -Focus on what's right with your life, not what's wrong -Control the only person you can--yourself -Invest in yourself to become more mentally, physically, emotionally, and spiritually fit -Use your newly discovered joy to become a more positive and productive influence in the world--and much more "As a reformed depressed person, I did not wander into my happy place. There was a personal evolution to my happiness revolution," says Lisa of her own journey. A sought-after expert in life-crisis triage, including addiction and trauma recovery, she is acclaimed for her dynamic "H-Factor" process that makes it possible for anyone to elevate their well-being through attention, intention, and action. Lisa's proven techniques and work as host of the popular Harvesting Happiness Talk Radio show have helped millions of people around the world generate more joy and fulfillment in their lives.